The Tarot deck has four suits of cards that describe the fundamental ways in which we all take in experiences: thought, feeling, creativity and material reality. When a card appears from the suit of Cups in your Tarot reading, the topic covered is emotions. We have a variety of feelings depending on the situation and they are all expressed in one form or another by one of the fourteen cards of the deck that belong to the suit of Cups. Feelings arise from and create unconscious responses. Quite often people attempt to control or suppress how they feel. There are also times that in expressing their feelings, people act out of self-centered intentions. Denying your feelings or expressing them without consideration – these are rarely good decisions. Read below to see how each card in the suit of Cups manifests for you. Your feelings can run the gamut from simple confidence to full psychic intuition. Your public expression of feelings will consist of expressing your love for someone, or moving beyond words and giving sympathy and help to people in need. The highest manifestation of the Ace of Cups is the act of forgiving another person. The feeling of being complete when you are with a certain person is the dominant emotion when the Two of Cups appears in your Tarot reading. On an external level, you will acknowledge this feeling when appropriate. It may be hard to tell your friends how good they make you feel, but you will notice the difference they make when you are alone. A demonstrative showing of your appreciation for the important people in your life arrives when the Three of Cups appears. It is almost impossible for a person to admit feeling ungrateful. The Four of Cups shows that you carry a seething resentment over what is being offered to you. Outwardly, the people in your life who are unaware of your feelings are the ones who are closest to being hurt by your wrath. The Five of Cups indicates a deep sorrow can engulf you and function as a cut-off from feeling anything else. This internal emotion is hard to suppress in your outward actions. A quiet and introspective demeanor masks your grief from those who have not been informed about your recent brush with tragedy. No matter how you appear, when the Six of Cups is in your reading, you have an innocence that borders on a detachment from all the problems in the ordinary world. Your pleasant outlook could confuse anyone who tries to get to know you, and you may be seen as an easy, unaware mark by someone up to no good. The Seven of Cups is the card that appears when your hopes are at their highest, and yet the payoff is rarely as great as you imagined. Your feelings of confidence have you deluded and while you may convince some acquaintances, people with a connection to the rational can take advantage of you at this time. Avoid salespeople! The internal response is to take flight instead of fight. The desire to be elsewhere is caused by an emotional longing for something or someone who is absent. An outward expression of the feeling of the Eight of Cups is signaling discontent with the present situation. Planning for your weekend Vegas getaway creates feelings about all the excess coming your way. The Nine of Cups embodies the love of pleasure and fulfillment and all the selfishness that may arise because of it. You feel entitled to quite a bit, and you might get it all, but what then? Feelings of satisfaction and love arise when the Ten of Cups is revealed. These are feelings that are on a strong foundation. You have a private sense of feeling complete. This sense coexists with a lover or close friends and family whose emotional wholeness exists because of the love you give to their lives. The Page of Cups illustrates a new level of emotional responses can lead to your growing sophistication. Understanding the way the world works brings feelings of confidence, but there will always be conflict with your childlike sense of wonder. Rapid developments and changes that are occurring will not go by without inducing some sort of feelings in you. The Knight of Cups is highly susceptible to the other cards around it in your Tarot reading. Your sentimental nature feels like giving in, but your public persona holds the line with a commitment to tradition. The queen’s feminine nature matches up well with the emotional suit of Cups and the Queen of Cups indicates great personal growth. Being in control of your emotions is a state of grace. Like the King of Cups, you can provide outward leadership when you are in touch with your feelings but able to not let them drive your behavior. This is not an aloof cerebral position; it is one where love and passion have found their best outlets for your mature self-expression. A Tarot reading with many cards from the suit of Cups is a reading about emotions. If there is just one card from this suit among the many in your reading, your emotions are not playing a big role in your life at this time. 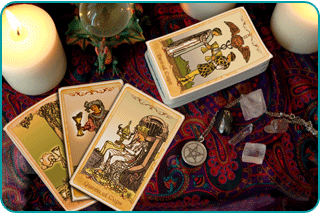 A reading with lots of Cups and the Ace of Wands present indicates that your intuition is never going to be higher. The Ace of Pentacles in a reading predominated by the suit of Cups indicates an opportunity to get the money you need to resolve certain issues. When there are many Cups in a reading with the Ace of Swords, your emotions have been influenced by an exchange of words with someone. One idea or phrase may have totally influenced you more deeply than years of other communication. When your Tarot reading has two Cups cards that are in numerical order, this shows an evolution of feelings and you can look at the way your life is going as the way your emotions are flowing. Your Tarot reader can offer insight on the direction things seem to be taking, but listening to your heart is the very essence of the suit of Cups.